Remember the Thick Gel Sealer I introduced to you a few months ago? If you haven’t already grasped the technique in using it, you had better be quick! 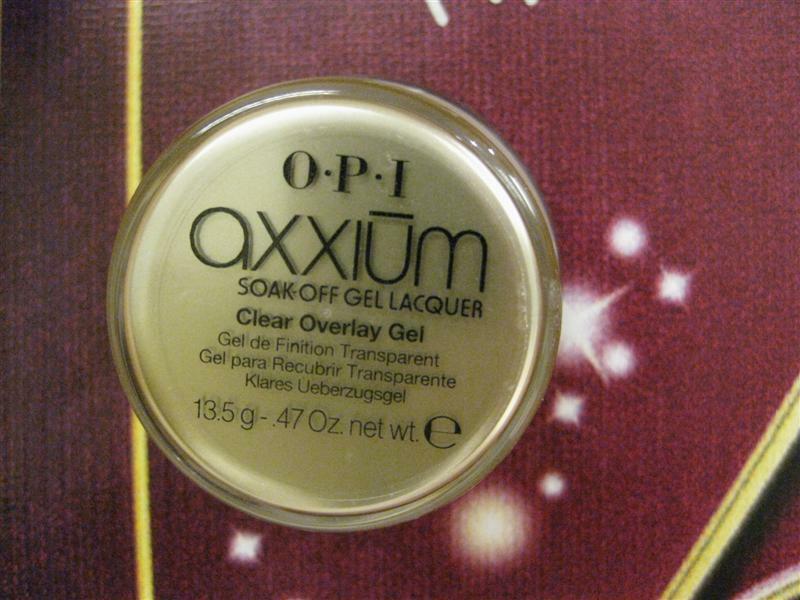 OPI has introduced a new Axxium Soak Off Gel Lacquer companion product: the Clear Overlay Gel. If your natural nail plates are wavy, ridged, scooped or too flat, the Clear Overlay Gel will give it a smooth finish and add body. It also strengthens your nails and gives a thin layer of protection. One of the distinct features of OPI Axxium Soak Off Clear Overlay Gel is that because it belongs to the Soak Off family, you can soak it off just like the Axxium Soak Off Gel Nail Polish. An other great feature of Axxium Soak Off Clear Overlay Gel System is that french nails with pure white tips can be achieved using the Overlay Gel as well. However, it is just a transparent layer only to even out the surface, therefore it cannot be used to extend the nail tips. Natural nail plates need strength or to smooth out rough surfaces? Apply Axxium Soak-Off Base Gel; cure 1 minute. Apply Axxium Soak-Off Clear Overlay Gel, adding extra gel at the stress area; cure 3 minutes. If necessary, smooth with an EDGE100/180 File, dust and cleanse nails. Apply Axxium Soak-Off Gel Lacquer according to directions, curing 2 minutes each layer. Apply choice of Axxium Soak-Off Gel Sealer or THICK Gel Sealer; cure 3 minutes. Create natural looking “French” nails using OPI Structure or Perfection Tips? Strengthen them with Axxium Soak-Off Clear Overlay Gel. Optional: Apply Axxium-Soak Off Gel Lacquer according to directions, curing 2 minutes each layer. Need to fill in dips in “French” or two-tone effects? Apply chosen free edge color in two layers, curing 2 minutes each layer. Apply Axxium Soak-Off Clear Overlay Gel, adding extra gel at the stress area to fill in low spot between free edge and nail plate; cure 3 minutes. If necessary, smooth with an EDGE100/180 File, dust and cleanse nails. Apart from what OPI recommends, how would you use this new Axxium Soak Off Clear Overlay Gel?